Mimicking what felines eat in the wild, Stella & Chewy’s Freeze Dried Cat Food contains real, raw meat that has simply been freeze dried. All you have to do is add water and serve. The popular Duck Duck Goose flavor is comprised almost completely of meat (98 percent meat, organs, and grounded bones from only cage-free birds) and has added taurine and probiotics for overall healthy digestion and muscle function. 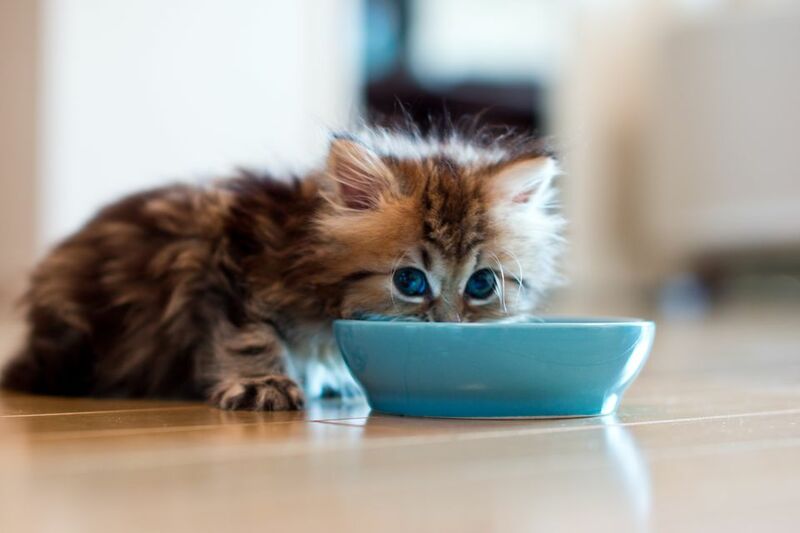 The freeze-dried cat food has no added hormones, antibiotics, grains or fillers. Available in 3.5-ounce, 9-ounce, 12-ounce and 18-ounce sizes. The chicken recipe for Nature’s Variety Instinct Raw Market Nuggets is comprised of 90 percent high-quality chicken and liver and 10 percent vegetables and fruits for added vitamins and minerals. The fruits and veggies, like carrots, pears, and butternut squash, are all organic and the chickens are raised cage-free. To serve, crumble up the nuggets and add water. The nuggets are also grain free and gluten free. Available in a 2 ounce small bag and a 12-ounce large bag. Enjoy the Primal Pet Foods Freeze-Dried Feline food in the turkey formula for a superb taste and quality protein. The freeze-dried raw food has 93 percent turkey, organs, and bone (an ideal source of calcium) and 7 percent produce and supplements for a completely balanced meal. The birds used for this food are raised without added antibiotics or added hormones for an all-natural protein source. The turkey formula is free of grain, gluten, corn, wheat and soy. Other ingredients include organic collard greens, squash, celery, pumpkin, sunflower seeds, quinoa sprout, cilantro, kelp and coconut oil, as well as almonds, cranberries, and blueberries. Available in a two-pack of 14-ounce bags, or a four-pack of 14-ounce bags. Use the Instinct Rawboost Mixers meal enhancing bits from Nature’s Variety to top your cat’s kibble for an extra element of flavor and protein. The freeze-dried raw bits come in chicken and rabbit flavors, both made with real meat. Fruits and vegetables, like carrots, apples, squash, pumpkin seeds, broccoli and blueberries, and are added in for extra vitamins and minerals to ensure a healthy coat and immune system. The bits contain no grain, potato, corn, wheat, soy, by-product meal or artificial colors or preservatives. The only ingredient in the Cat Man Doo Life Essentials Freeze Dried treats is salmon, 100 percent freeze dried Wild Alaskan Salmon. There are no additives or preservatives in these salmon pieces that are served best as treats or atop dry kibble. They are high in protein and low in fat, with natural fish oils to help maintain a shiny and healthy coat. The Whole Life Pet Chicken Breast treats for Cats contain only one ingredient: chicken. With their freeze-dried treats, there are no preservatives, grains, glutens and no nutrient loss either. They are human grade, so your furry friend will love them. They’ll never know they are eating cat food. The freeze dried chicken pieces in the Northwest Naturals Freeze Dried Raw Diet for Cats are made from poultry that are raised with no added antibiotics or hormones. Ingredients include 98 percent chicken muscle, organs, and bones, and just 2 percent of everything else to add vitamins and minerals, like fish oil, Vitamin B supplements, Vitamin E and D supplements, and eggs and ground flaxseed. There are no added fruits, vegetables, grains or gluten. Inside the package for the Wysong Archetype Raw Feline Diet Cat Food you’ll find chunks, shreds, and powder that comes from freeze-dried meat. The flavors include chicken, quail, and rabbit that are supplements with various fruits and veggies, like carrots, plums, blueberries and chia seeds. Other vitamins and minerals include plant nutrients, prebiotics, and probiotics. The food is starch free.